A £13m regional fire control centre for south west England which has stood empty for three years, could now never become operational. Part of the coalition's Programme for Government policy document said it would "put an end to the forced regionalisation of fire brigades". The Fire Brigades Union (FBU) said the government should now honour its pledges and scrap the Taunton centre. But centre boss Mark Healey believes the project will still go ahead. 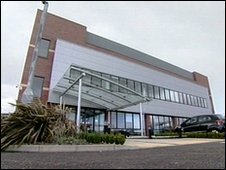 The building is costing the taxpayer an estimated £5,000 a day. Mr Healey added: "Let's set the money aside that has been spent on this superb 21st Century building. "Yes I'd like to see it go ahead." The local FBU have described the centre as an "obscene waste of public money" and a "white elephant which needs be put down". It has called on politicians to honour their election promises to scrap this project. Tam McFarlane, from the South West FBU, said: "Both the Conservatives and Liberal Democrats have previously said this project should not go ahead. "They've got that power now. It's time they honoured those pledges and scrapped it." The Taunton control room will cover Gloucestershire, Wiltshire, the greater Bristol area, Somerset, Dorset, Devon and Cornwall. If the commanders of the seven regional brigades do not want the centre then its future remains uncertain.